Ciconia is a genus of birds in the stork family. Six of the seven living species occur in the Old World (Europe, Asia, Africa) , but the Maguari Stork has a South American range. These are large storks, typically 100 cm tall, with a 180 cm wingspan and a long thick bill. Members of this genus are more variable in plumage than other storks, but several species have black upper bodies and wings, and white belly and undertail. Juveniles are a duller, browner version of the adult. Ciconia storks are gregarious and colonial breeders, and pairs stay together for life. They typically build large stick nests in trees, although the Maguari Stork will nest on the ground and at least three species will construct their nests on human habitations. One of these, the White Stork, is probably the best known of all storks, with a wealth of legend and folklore associated with this familiar visitor to Europe. 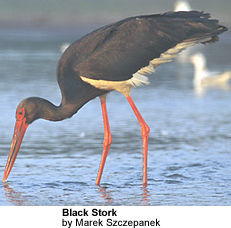 Ciconia storks feed on frogs, insects, young birds, lizards and rodents. They fly with the neck outstretched, like most other storks, but unlike herons which retract their neck in flight. The migratory species like the White Stork and the Black Stork soar on broad wings and rely on thermals of hot air for sustained long distance flight. Since thermals only form over land, these storks, like large raptors, must cross the Mediterranean at the narrowest points, and many of these birds can be seen going through the Straits of Gibraltar and the Bosphorus on migration. Remains found in Late Pleistocene deposits of San Josecito Cavern (Mexico) may also belong into this genus (Steadman et al. 1994). The proposed fossil genus Prociconia from Brazil, also of Late Pleistocene age, may be a junior synonym of either this genus or Jabiru. A Ciconia bone found in a rock shelter on Réunion was probably of a bird taken there as food by early settlers; no known account mentions the presence of storks on the Mascarenes.